Our best-in-class instructors are internationally recognized subject-matter authorities. Spend a day with the experts and immerse yourself in the foundations of real-world process improvement. Our training courses are specifically designed for forward thinking business and technology professionals interested in learning and applying the most current ideologies, strategies, disciplines and methodologies to their specific business environment. Be sure to login to see your rates. Upgrade to pro for instant savings per course! Join the Corporate Sponsor program to save 25%! Achieving success with BPM relies upon skill in process modeling, analysis and design. This course equips you with the practical, applied knowledge to lead/facilitate process improvement projects. Operational Excellence (OpEx) stresses the application of key principles, the alignment of management systems, and the application of process improvement tools. Operational Excellence has a focus on a long-term change in organizational culture. Participants will learn how to function tactically and strategically as an agile business analyst. Detailed work and hands-on exercises will include writing user stories, decomposing epics, analysis wall management, and practice with more techniques. Let everybody know you’ve achieved that mastery by becoming a Certified Business Process Management Professional from the industry's top BPM educational organization. 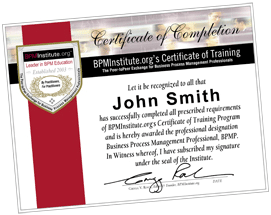 BPM Certification from the industry's leading authority in BPM education. This course builds a comprehensive understanding of how to establish process governance with a focus on the emerging roles of process owner, process council, and the process office. Organizational change management (OCM) is needed for success with business improvement and transformational programs. This exercise based course provides insight on OCM and reorganization, technological change and process based change initiatives. If you can't make it to Chicago in person, attend the event virtually. Preview the experience in this short video. Choose the virtual option during registration. Two tools for easy course selection and guidance. Choose from seven professional certificates around the most critical career paths.